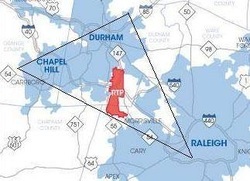 The three cities that make up the Triangle are first class, each with a different feel. 1. Weather is mild enough for year round participation in sports. Put away your snow shovels except for an occasional event snow event when the world is sparkling white, calm and quiet. Enjoy the Southern tradition of relaxing, making snow cream or watching videos. 2. Dynamic business environment due to the Research Triangle Park, the capital city and the many world class universities, UNC Chapel Hill, Raleigh’s State University and Duke in Durham. 3. World class medical facilities through UNC Chapel Hill and Duke University with major hospitals in all parts of the Triangle. 4. Cultural opportunities with two major venues for live performances, Performing Arts Center downtown Raleigh and Durham Performance Arts Center plus a myriad of outdoor stages. 5. Sports enthusiasts support the university circuits and the NHL Ice Hockey Hurricanes call Raleigh home. 6. Central location essentially equidistant to the mountains or ocean and 4.5 hours to Washington DC or an easy 2 hour train ride to Charlotte on one of the busiest routes in the SE. 7. Outdoor recreation about with Umstead State Park, Raleigh City Parks with sports facilities, trails, dog parks and access to miles of bicycle/walking/jogging trails. Jordan Lake and Falls Lake provide opportunities for boating, swimming, kayaking plus Kerr Lake and Lake Gaston on the Virginia border. 8. Great dining opportunities all over the Triangle with exciting choice of culinary styles, food truck rodeos offer innovative menus at the many celebrations such as Artsplosure in the Spring and the Blue Grass Wide Open Festival in October. 9. Lower taxes for the county and municipalities. The average sales price YTD for the Triangle Multiple Listings Service (TMLS) thru May of 2014 is approximately $240,000. Taxes in the City of Raleigh would be $2,220. 10. Stable real estate market. While many parts of the country saw drastic declines in market value, the Triangle as a while plodded along with less of a loss. The average price appreciation is 3.5% per year.